At one of his biggest electoral outreaches of the 2019 Lok Sabha poll campaign on Sunday evening, Prime Minister Narendra Modi kept the focus on the issue of national security, his efforts at rooting out corruption and his agenda for the next five years. He said the nation did not need ‘rajas and maharajas’ and it made him happy that the spirit behind chowkidar (watchman) is expanding. At the close to two-hour ‘Main bhi Chowkidar’ interaction with a packed audience at Delhi’s Talkatora stadium, streamed live on television channels, including state broadcaster Doordarshan, the PM tried to convey that the people of India had already made up their mind to return the chowkidar to power on May 23. Modi asked the party workers to consult the facts put out on NaMo app to dispel Opposition’s “lies” and reach out particularly to first-time voters. Modi said he brought India close to entering the $5-trillion economy club in the world, and in the next term he would want India to enter that club. While the PM reiterated his promise of doubling farmers’ incomes and house for all by 2022, there was no mention of his government’s scheme of Rs 6,000 to small and marginal farmers. Modi said he had delivered on the promises made in 2014 of protecting the taxpayers’ hard-earned money by being an honest chowkidar. The PM said in five years, he brought those who looted people’s money to the threshold of jails and now needs people’s blessings to put them behind bars. The PM said his objective would be to strengthen the education sector. 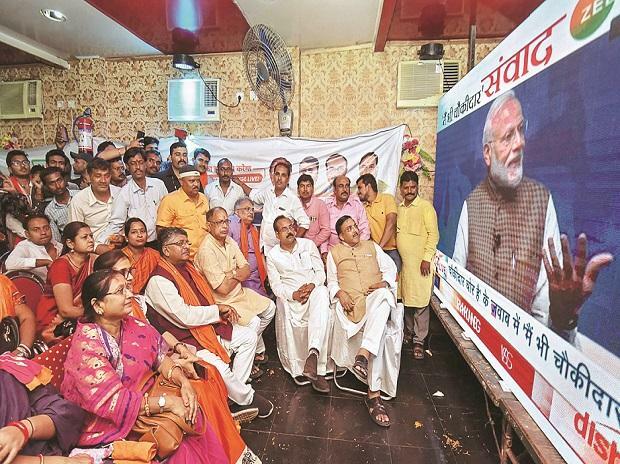 According to the BJP, the event was seen at 500 spots across the country through video conferencing, and the PM took questions from audience gathered to watch the speech in cities across the country. Amid frequent chants of “Modi, Modi”, the PM said he devoted his first term to fill the ditches and potholes in the system, and would build “grand buildings” on these in the forthcoming term. He said his government tried to deliver the “needs” of the people in the first five years, like electricity, toilets, roads, airports, etc, and would focus on fulfilling aspirations of people in the next five years. “We spent the first five years solving immediate problems, and the next five years would try address people’s aspirations and take the country to new heights,” the PM said, adding that by 2022, the 75th year of India’s Independence, all families would have a pucca house and farmers’ income would have doubled. “We need to take forward the spirit of chowkidar in every field, in every sector, village, town, home…,” the PM said. Without mentioning the Congress or its promise of minimum income guarantee, the PM asked people to be aware of “false promises” by people who know they would not come to power and are busy “distributing goodies”. Modi advised people to look at their “track record”, and not “tape recorder”, a reference to Congress President Rahul Gandhi. Modi said the “prince” lacked in intelligence and thinks a chowkidar is only someone who wears a uniform, blows a whistle and wields a stick. The PM likened his vision of chowkidar to Mahatma Gandhi’s principle of trusteeship. He said he was convinced the people of India would select a chowkidar, it does not need an emperor or a king. On Balakot, Modi said Pakistan would never admit to terrorist camps suffering damage in India’s air strike, as it would mean admitting that it exports terrorism. To loud cheers, the PM said Pakistan should not make the mistake of thinking Modi would not launch another such strike as he is busy in elections. “Elections are not my priority, my country is my priority,” he said. On corruption, the PM said the delay in putting the corrupt behind bars was because of officials, who have now been replaced. On the anti-satellite test, Modi referred to Congress leader P Chidambaram’s statement and said he lacked “sa-bu”, or “samanya buddhi” (common sense) in questioning the strike. Modi said why should India keep it a secret when others with that capability have publicised it whenever they have tested it. Modi spoke about his government honouring B R Ambedkar, providing reservation in jobs and education to the ‘‘general category’’. He said he was like an honest cop and criminals have ganged up to oust him just as they come together to get an honest cop transferred. Speaking about direct benefit transfer, Modi said the government saved Rs 1 trillion while ‘DBT’ for the previous government meant ‘direct bichauliya transfer’. The PM said Odisha could surprise the country this time by supporting the BJP.